Here are picture of models that don't fit in one of the other sections. These are miniatures I did buy or build just because they look cool. 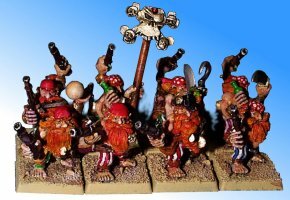 This is my new chaosdwarf army standart bearer. It is heavily converted with parts from the regiments box command group sprue and a bretonian helmet. If you like, you can get the banner from the banner section. 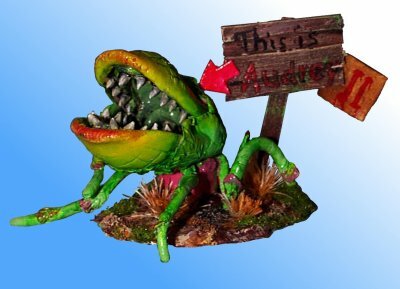 This is the Grenadier swamp dragon. I saw it in my local hobby store and just had to buy it. I did not add the long tongue that comes with the dragon. I wanted to give them a really nature skin tone but it didn't quite work out. They don't look like creatures of the night, but like they just come home from a day on the beach. As you see the wings are not black like the ones from the GW harpies. I am not quite sure which way looks better. 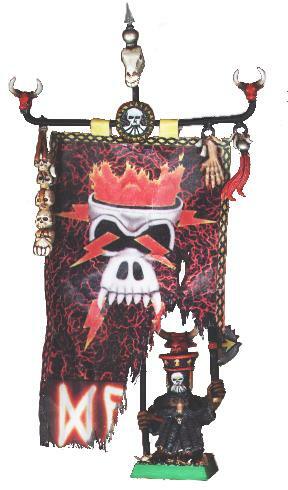 These is the regiment of renowned "Long Drong Slayer's Pirates". 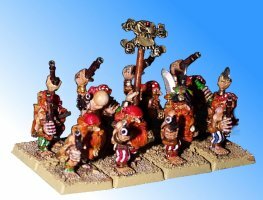 Models are Games Workshop 1998, component code 99 25 02 14 006. No designer is stated on the package. The sand base was one of my best ideas. The base is painted with bleached bone, shaded a little bit with brown and then hightlighted with white. 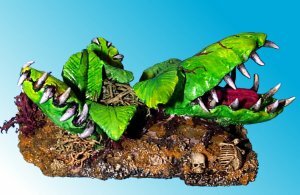 This is a scenery piece I did build for the 2000 Warhammer tournament. 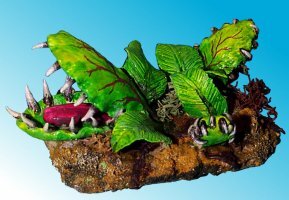 The carnivorous plant and the leafes are modelled out of FIMO. The whole project took about 4 hours to build and paint. As you see the paint job is not perfect. It was first painted with green and yellow. Then highlighted with more yellow. 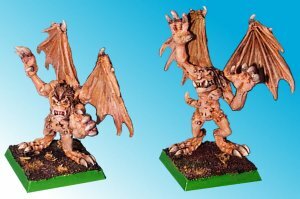 The tooths were painted brown, highlighted with bleached bone and white and shaded with black. 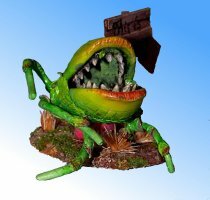 After the mantrap looked so nice I thought about building Audrey II from the film "A little shop of horror". 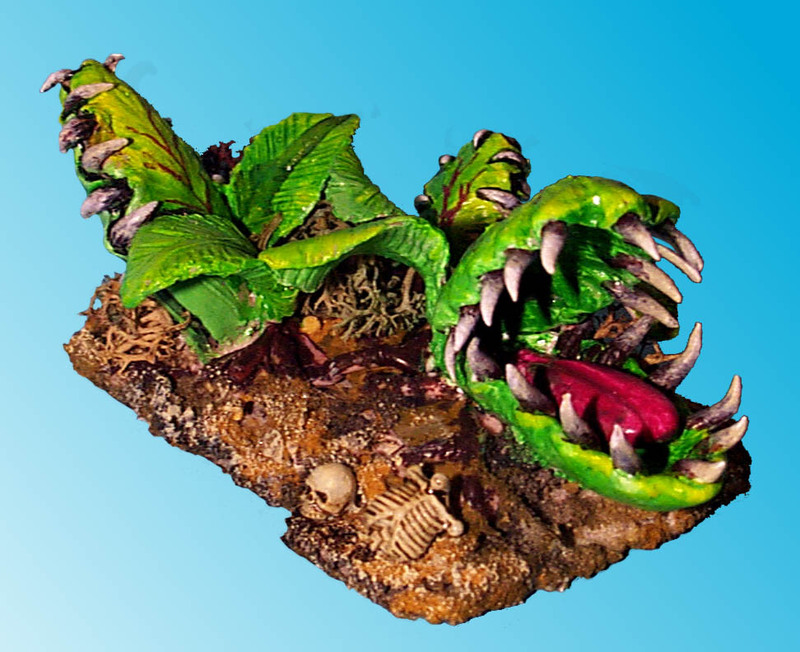 In this film the small plant grows larger when eating blood. This ends in chopped up humans. Audrey is (like the mantrap above) made out of FIMO and then painted. Below is a picture from an other angle of view.